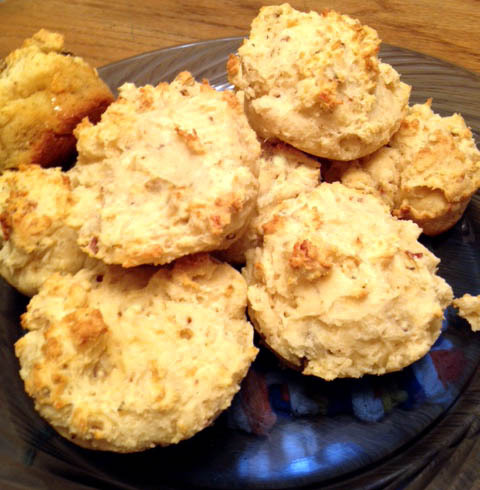 The Pioneer Woman and Kait Nolan both have yummy looking bacon cheddar biscuit recipes. I wanted to try my own version but to be fair I started with their recipe and ended up with something different. Add the buttermilk, water, egg white and apple cider vinegar to the flour mixture. Stir well. Bake 20 min. then check with a toothpick to see if done. They may need up to 5 more minutes. So what did you think? I made a similar but different version and the coconut flour was a bit too much for me. A little too sweet. I wanted it more savory. I'm thinking the cider vinegar and Italian seasoning might do that. They were really good, not sweet at all. Alas, I can't have dairy either, but we're nearly there! Going to try an amendment to your biscuits, Diana, because you can't go wrong with coconut and almond flour. Should taste amazing. oh no dairy either? That makes it tough. Good luck. Let me know how they turn out.